Found the skeleton to nymph..this is second one I found in my yard. 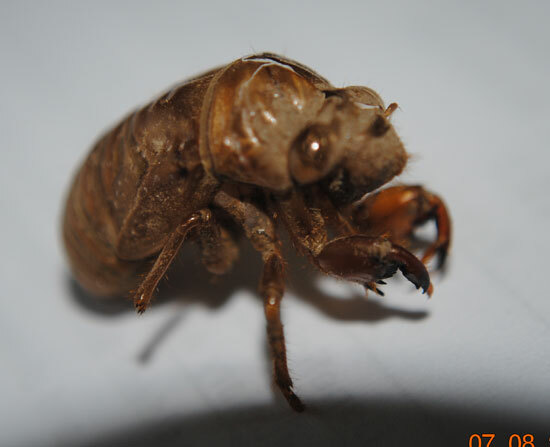 Thanks for the very cool photo of a cicada cast-off nymph skin. - (known as exuvia). I am unable to determine from which species this came from but judging by it's shape I can at least tell you it is from the Tibicen genus judging by its hunch-back shape and color. I found one of the skeletons in my back yard yesterday 7/7/2011 in RI and creepy enough to me after visiting family in a different town found a little tiny albino one sitting on my leg as we were driving back home..Had to do some research once I got home..are they supposed to be in RI now? Thanks for your email. Yes, Rhode Island lots of annual cicadas and they should be emerging right about now. I am curious about your albino one. Was it white with red eyes? Also how big was it?